"Emergence of Order II". Photographic reproduction of original painting. Copyright 2006 Robert Corkery. 80 cm x 80 cm. Acrylic on linen. Red, yellow and white paint applied with a stick in the manner of an Australian aboriginal dot painting. The inspiration for the original work came from the complicated curved and interconnected tunnel structure and surfaces defining the inside of termite mounds. Mathematically these structures can be described in the same geometric language used to describe the huge network of inner membranes in the organelles of living cells, soap bubbles, punctured surfaces of complex black holes and therefore shape of spacetime itself including its strings. The language of differential geometry and topology is used to formally describe these surfaces and their inherent curvature. When Einstein read that Riemann introduced a concept that distance at any point in space changes depending on the distribution of matter in it, led him to a search for a geometric theory of gravity beginning around 1912 and three years later to celebrated general theory of relativity. The way that matter moves is determined by the curvature of the space. So the existence of forces in the universe is equivalent to the existence of curvature. 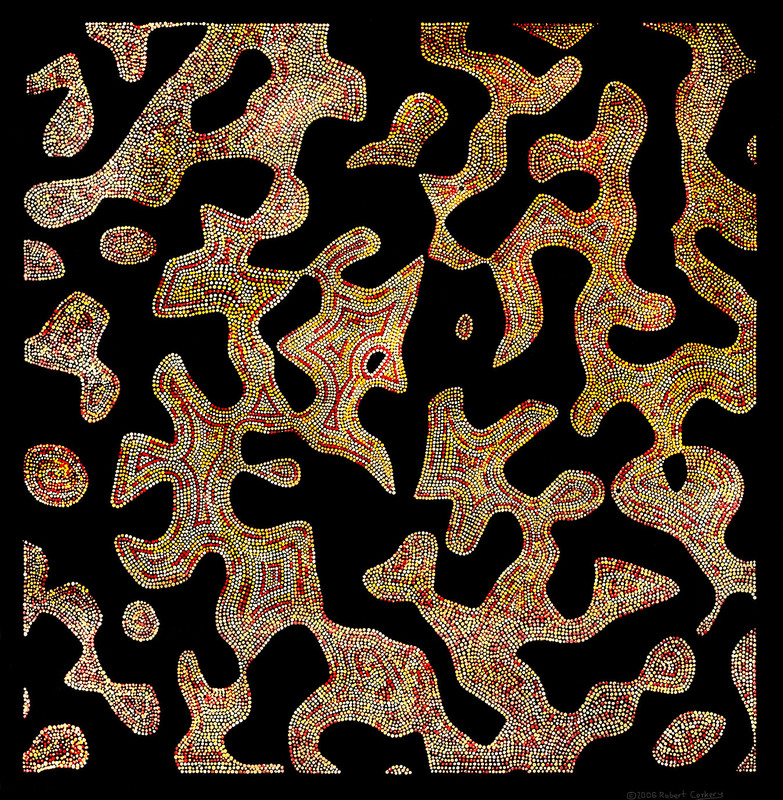 The particular pattern in this painting was generated in a computer simulation using a 3D random Gaussian field of waves and then taking a cross section through it. The computer generated pattern was printed out onto gridded paper, and then I hand drew the pattern from the paper onto canvas. Dots of pure red, yellow and white were then applied to the canvas, painstakingly over several months. The patterns that emerged were not planned and surprised me as they became ordered, particularly as the painting proceded. This emergence of order is reminescent of the emergence of order in the evolution of the termite mound structure over geological time and over the lifetime of an individual nest. It mimics the order emerging in Nature due to evolutionary processes. This painting is the second dot painting in a series made on this topic. The first was destroyed in a deliberately lit apartment fire in New York City a few years ago. But a photograph remains!. The same type of pattern was used in the "oil spill" and "random Gaussian field" digitally created pieces posted earlier on this website.